Life is never more romantic than in those heady months after you’ve tied the knot. The sweet memories radiate around your beaming aura like a butterfly to a flower. While on your honeymoon you lie basking in the rosy glow of love and marriage, reminiscing flashbacks of your special day. That fairytale scene of you elegantly arriving in a luxurious chauffeur driven Bentley wedding car, chauffeured to perfection, relays hedonistically in your enchanted mind. Till CRASH, BANG,WALLOP, back down to earth you come while you watch the wedding videos. Those happy-ever-after celebrations, that start to domestic bliss, that beautiful wedding entrance! Now back in the real world it’s not quite the fable you had quite imagined? Here you actually are, crawling un elegantly out of your regular little run around. Come on, you can never start your journey into your perfect new life in your…… ‘old banger’ !! You wouldn’t turn up to a horse gymkhana in a hot air balloon now would you?!! No, you wouldn’t, and this is why we have stepped in to help you create that perfect wedding entrance, with the perfect chauffeur driven wedding hire car. With Special Day Cars your one chance, one opportunity to have that fairytale wedding you have always dreamed of can come true. We at Special Day Cars pride ourselves on providing you with all the memories to collage together to create those heady enchantments to reminisce on your honeymoon and forever more. All you need to do is contact us at Special Day Cars. Together we will provide a unique tailor made package to meet your every need. We know that a special entrance is important and we know you want a professional chauffeur, and we know you want to book with a reliable company. 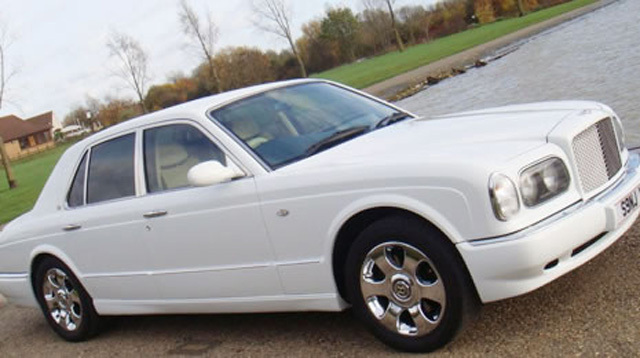 So look no further- Leave your banger in the garage for this special day, and indulge in a stylish, pristine , eye-catching and beautifully refined chauffeur driven Bentley Arnage. Now lie back and dream for a while. Soon that fairytale will no longer be an amazing mirage in your mind, it is planned to perfection and will soon come to life! !